The collapse of Woolwich Arsenal: how the rescue took shape. Part 5: Summer of 1910; How the rescue took shape. Having played their last league game of the season on 23 April Arsenal now had two friendlies to play before the club closed finally for the summer. On 28 April 1910 Arsenal arranged a friendly away to Colchester (which they won 3-2) in front of just 1000 spectators. The team was a mixture of first team and up and coming reserves. Two days later the reserve side lost 2-3 away to Ilford. No crowd total is recorded. Then, in an interesting move (given what subsequently happened), on 5 May 1910 Henry Norris and Charlie Buchan entered discussions for Buchan to transfer from Woolwich Arsenal to play for Fulham, under a contract that allowed Buchan to carry on with his teacher training course at the same time. Buchan had played some reserve matches for Woolwich Arsenal in 1910 but didn’t settle in the side, and I am not sure that he actually had a contract with Arsenal. Certainly Arsenal’s financial problems might suggest not, and by early May Buchan appears to have been doing the rounds looking for a new club. According to Buchan, in a subsequent newspaper interview, Norris did not handle the negotiations well, making Buchan an offer of £1/10/- a week (£1. 50p). Buchan rejected this announcing that Bury had already offered him twice as much, and there the matter was then dropped. And yet Buchan didn’t go to Bury since he obviously had an interest in staying in London to continue his studies, and instead moved to Leyton for one season before making his name as a centre forward the following year at Sunderland. But now, before anything else could be arranged, on 7 May 1910 King Edward VII died unexpectedly; which threw a spanner in the works of Arsenal’s attempt to restructure the club as it was deemed unseemly for such commercial activity to continue until after the funeral. 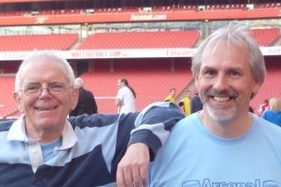 Nevertheless George Leavey did continue trying to raise awareness in Arsenal’s new share issue admitting on 11 May that not enough local people had agreed to buy shares in the club, so he would nopw search for others from outside the area who might be persuaded to buy. This resulted in renewed approaches to Tottenham Hotspur and Chelsea. On Friday 13 May representatives of the Football League had a discussion about Woolwich Arsenal’s problems at its management committee meeting, deciding inevitably that it needed to have more information before attempting to resolve what kind of financial rescue of Woolwich Arsenal it would sanction. Obviously it would be happy if Woolwich Arsenal FC found a new sponsor to clear the debts, and thus carried on as the same club, and it would not have much of a problem with the club going into voluntary liquidation and then being reformed if the new club had the resources to complete a season in the First Division. But the League seems to have found talk of the involvement with other clubs troubling, for this was uncharted territory and there was little in the rule book of the day about such a move. However the League clearly felt it had the right to reject any out of the ordinary proposals that were not covered by the rule book. The management committee of the League therefore decided at this point to hold a second meeting at which representatives of both Fulham FC and Woolwich Arsenal FC would explain in more detail what (if anything) they were proposing, and to clarify if Arsenal had the wherewithal to compete in the forthcoming season. This meeting took place at the Imperial Hotel in London on Wednesday 18 May 1910, with J J Bentley, Charles Sutcliffe and T Harris representing the Football League Management Committee. George Leavey attended on behalf of Arsenal as the lead benefactor of the club. Given that at this stage Fulham appeared to be the only rescue package on the table for Arsenal it also seems highly unlikely that Norris and Hall were not there also. It also seems likely that William Allen of Fulham was present because the proposal that George Leavey put forward was that Norris, Hall and Allen would become directors of a new company to run Woolwich Arsenal FC in Woolwich. Now to understand fully how this meeting went we must realise that at this stage, many of the rules about what clubs could and could not do were simply devised as time went by. The rule book of the Football League was far from complete, and it included nothing about ground sharing, or come to that, the issue of gentlemen being directors of more than one club at a time. So the management committee effectively made up a lot of the rules as they went along, and if they thought these rules were important enough they wrote the precedent which evolved from events into the rule book to be taken note of in the future. At the same time we must also recognise that the management committee wanted a solution that allowed Arsenal to continue in the League. The club had wide support, and although crowd numbers were down, for a while Arsenal had been the club with the second highest attendance record in the league. What’s more, the League valued its southern clubs, not least as a bulwark to ensure that the Southern League realise its ambitions to take over all professional football in London and the south. Indeed it was this desire that had led the Football League to give Chelsea a place in the League (after the Southern League turned them down following Tottenham’s objections) even though the club had never played a single game. Thus the League wanted Arsenal to survive, but they also needed to show that they were not a pushover, for fear that other clubs in difficulty would propose mergers rather than finding new benefactors (which is how most clubs survived). Thus the League began the meeting by suggesting that both a merger and a groundshare were out of the question. Leavey was probably ready for this and so came up with an alternative ploy: that there was nothing in the rules to stop the directors of one club also being directors of another club. This move outflanked the Management Committee who had seemingly played their two main cards at the off and not considered this suggestion as being central to the case. So the League, having made no objection in advance, were forced to agree to three Fulham directors becoming Arsenal directors, but only for one year – another “rule” made up on the hoof. If was also clear that these new rules said nothing about where a club might play. Indeed as everyone knew, Millwall, Arsenal’s nearest neighbours of any significance, were at this very moment moving across the river with Southern League approval. If Football League clubs were prohibited from moving that would make the Football League less attractive than the Southern League, and indeed stop clubs upgrading their facilities as they grew. Besides which the Fulham directors would work hard to keep Arsenal afloat and were offering to guarantee to keep Arsenal at Plumstead for at least a year, after which a move would be allowed. It is unlikely that the Fulham men had not foreseen this as a possible outcome, however although Hall and Norris signed up to the deal, Allen dropped out. Norris and Hall were now to run Arsenal with Leavey. According to Athletic News, of the two men left William Hall as the prime mover but it was Norris who was the PR front for the operation. This was not surprising as Norris was Mayor of Fulham (making him the figurehead of the ruling party in the borough) and a regular contributor to local newspapers. He would make sure the story was told from Arsenal and Fulham’s point of view. On 13 May it was confirmed that the share offer had failed, and the directors of the proposed new company started to return the share applications, as was confirmed in the Times the following day. But although there had been agreement by the League, there was still a feeling that there was more to come, and within days rumours were circulating that Tottenham, Chelsea and Rangers FC were all trying to buy shares in Woolwich Arsenal FC. But these were rumours and the lack of certainty as to exactly how matters were to play out, and the need for the League not to lose one of its most famous clubs, clearly made the Management Committee rather anxious. Indeed even though an agreement had been reached and signed off by the Committee, on 18 May there was a further meeting between the interested parties to resolve points of detail more clearly – a meeting in which Henry Norris clearly played a leading part. From what we know of this meeting it is clear that Norris knew he was in a position of strength (being the only viable option for keeping Arsenal going) because he used the interesting ploy of outlined plans that he knew that the Management Committee would reject in order to lead the League into accepting the approach that he had in mind all the time. The first offer was, in effect, downright cheeky. Henry Norris offered first to buy Woolwich Arsenal and pay off the creditors creating a new club, Fulham Arsenal, which would play in the first division playing at Craven Cottage. When they was thrown out, as of course he knew it would be, backcame the already rejected plan of ground sharing. This time it was the Arsenal representatives at the meeting who turned it down, although clearly they now had no power, since their share issue had failed and without the Fulham directors the club would be wound up within a matter of days. Indeed quite what Leavey would have done at that point if Norris and Hall had got up and left the meeting, of course we have no idea, but it would probably have left Leavey (as the guarantor of some of Arsenal’s borrowings and debts) bankrupt. And so the final fall back position agreed at the previous meeting came into being. A new board of directors for Woolwich Arsenal would be formed including George Leavey, Henry Norris and William Hall. Norris and Hall were to act in a personal capacity, not as directors of Fulham, meaning that they had to carry out their duties as directors of the company in the best interests of Woolwich Arsenal FC, without considering the wishes or interests of Fulham FC. As a result they now had one year to come up with a new, viable, stable Woolwich Arsenal. If it was a success at the Manor Ground then it would of course stay there. If not, as Millwall was at this very moment doing, it could move. However to fully understand this situation we need to stop for a moment and see what sort of club Fulham was at this point. While Arsenal were struggling (but in the end surviving) near the foot of division 1, Fulham were very much mid-table division 2. Here is how the second division league table looked at the end of the 1909/10 season. It is also worth looking at the attendance figures for the season and comparing the position of Fulham and Woolwich Arsenal. Looked at this way, we can see how desperate Arsenal’s situation was, for their crowds had fallen by another 20% and were down from a high of 19,980 in 1904/5. In other words Arsenal’s income had shrunk by about half in just five years. Indeed it could be argued that football was in trouble, because 75% of the top 20 clubs had suffered a decline in attendances. 20% of the clubs with the biggest crowds had suffered declines of 20% or more in just one season! Arsenal were in a bad way but were not alone. The League must have been aware of this and must have realised that whatever deal they worked out with Arsenal will have been of interest to other clubs. After all, one more year with crows declining like this and the whole future of professional football would start to be in doubt. True, Fulham’s attendance had also declined, but Fulham were now getting crowds 40% larger than Arsenal, while playing in a lower division. Thus we can see the attraction of the possibility of Fulham (or come to that Fulham Arsenal) in the First Division. If they were getting 14,300 in a modest year in the Second Division, what could they get in the First? The story continues in the next episode.